A mervellous anthology to read during the holidays, filled by the cosy Christmas atmosphere! 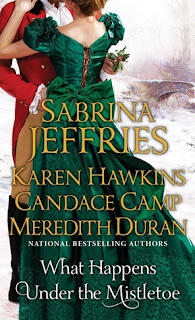 Once again Sabrina Jeffries demonstrates her enormous talent. No news here! This is an adorable, extremely sweet and so touching "intermission" in the Sinful Suitors series (intermission that is very needed since we will have to wait till next March to read the second novel). I had thought of Amanda Kean, Jeremy's sister, as full of potential in The Art of Sinning, she is the one, after Edwin Barlow, who caught my attention as a possible future heroine, I wanted to know more about her, she instantly presented herself as a strong woman, confident, ambitious but also with an aura of gentleness. All of this is confirmed here, in The Heiress and the Hothead; she is a great heroine, a pity that her happy ending is "constricted" in a novella. However, it is here that you can actually see the author's talent I always prise, when the end of the short story comes, there isn't a feeling of discontent; despite the actual length, this novella has the same density and refinement of one of her best novel, it gave me plenty of feelings, it's moving and engaging. The hero is perfect as well, very manly and smart; he possesses the arresting charm typical of intellectuals and of those who fight for social matters. This novella is a great piece of work, with a perfectly passionate amount of steaminess, typical of the author and with a touching sweetness between the protagonists. I'm a huge fan of Sabrina Jeffries, I always wait with a stressing eagerness her romances, this one, wasn't excluded and all my expectations have been greatly satisfied! Oh finally I manage to truly enjoy a Karen Hawkins' work. This novella is really catching, passionate and with funny and witty notes. I liked the plot (which is similar, but not identical, to Meredith Duran's one - see below), I'm very partial to story-lines that include sweet resentment, concealed secrets, everlasting feelings, incomprehensions, sharp retorts, irresistible attractions and so on. All of these are present here. For the first time since my first approach to Hawkins' books, I did appreciate very much the "matriarch" figure, which is a must for the author; in general, this is one of those things I don't adore particularly in her novels, to me, this kind of old character, often appear annoying and grotesque, however, this is not the case in Twelve Kisses To Midnight, where said persona, the Grand Duchess Natasha Nikolaevna, gives that sly and entertaining twist that enrich significantly the plot. The protagonists, Marcus, Duke of Rothesay and Kenna, lady Montrose, are adorable together, their attraction is irresistible, despite their attempts to ignore it (more his than hers), there's a strong passion between them and it is very well presented and communicated. I was unexpectedly much involved by their story and this novella in general. Lovely. Very nice story and admirably written and presented. I have to say that for some aspect I appreciate Candace Camp's short stories more than actual novels, and By Any Other Name is a demonstration of it. I enjoyed a lot the characters, especially the protagonists, and I definitely liked a lot the plot, it's fast-paced, captivating and interesting, Rylla and Gregory, in turn heroine and hero, are passionately suited and sweet one to another. There's only one detail I couldn't actually endorse, and this is the perseverance, if even stubbornness, with which Rylla tries to hide her identity to Gregory, to the point that I thought there would have been a very dark, shocking, secret behind this need to preserve her true name; whereas it's simply the heroine's "pointless" desire, which anyway, generally, always spices up the story and therefore it would be openly and happily accepted if not for the length with which it is protracted. Meredith Duran is one of those author who I've started considering as a certainty, I enjoy her style a lot, she has a great talent when it comes to build an historical romance good in every aspect, passionate, thrilling, emotional (very much so) and with adorable protagonists, the combination is explosive. Sweetest Regret is so touching! I crave those kind of romances where the two protagonists for a series of unfortunate events are separated and when they come back together there are sparkles everywhere, spiced up with sharp retorts, impossibly contained and fought passion, incomprehensions and realisations which culminate in a perfectly adorable and sweet moment of reunion and rediscovered/strengthened ardent love. The ingredients are all here and they are skilfully and flawlessly presented!